With exhibition games starting Sunday, the “workout” phase of Spring Training is wrapping up today. 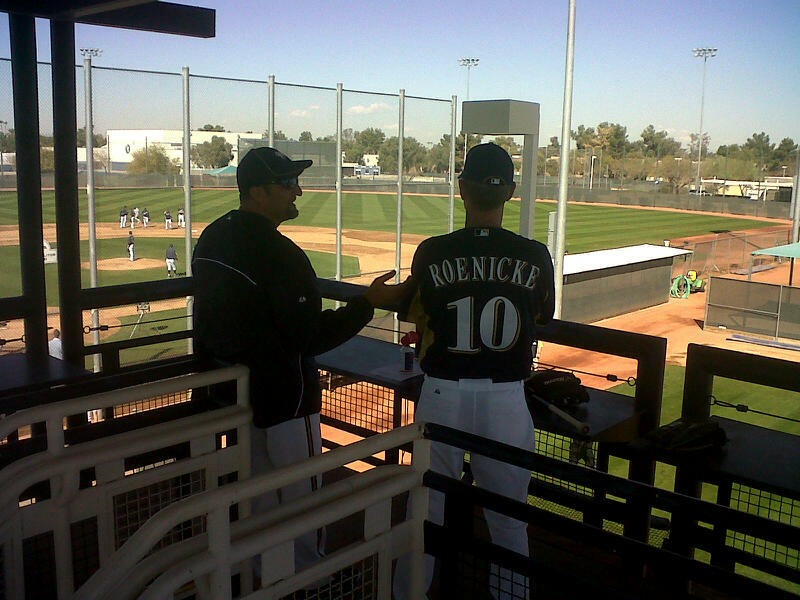 I have spoken to a number of players and to a man, they praise Ron Roenicke and the coaching staff for their execution of Camp. Brewers Third base coach Ed Sedar, and his distinguished profile that would make a chicken hawk jealous, is the man responsible for putting all the pieces together. He’s the “Camp Coordinator” and he’s one of the best in the business. 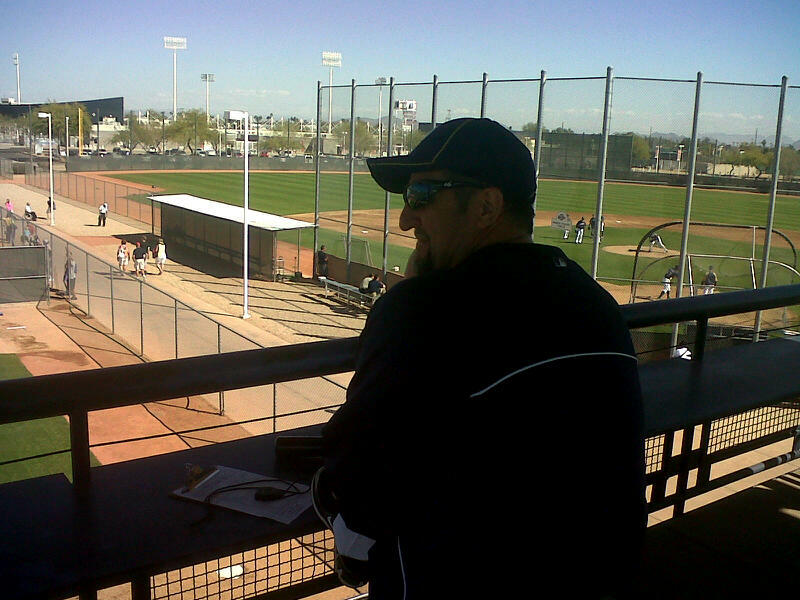 From his eagle eye view atop the tower that sits in the middle of the four “back” fields at Maryvale Park, Sedar is the one making sure the various drills/sessions go off without a hitch. A lot gets done in a short amount of time. It looks like chaos, but it is pure art to see played out. All of the individual groups: starting pitchers, relief pitchers, infielders, outfielders, catchers, etc…use every inch of every field. Bodies are everywhere, moving in concert. What seems like complete confusion to an outsider is orderly and precise to the participants. If not, they will let you hear about it. Every player has somewhere to be and something to do. Sedar takes input from the manager and the various coaches after each day’s session, stirs it all up and serves up the “workout stew” in digestible form the next morning. 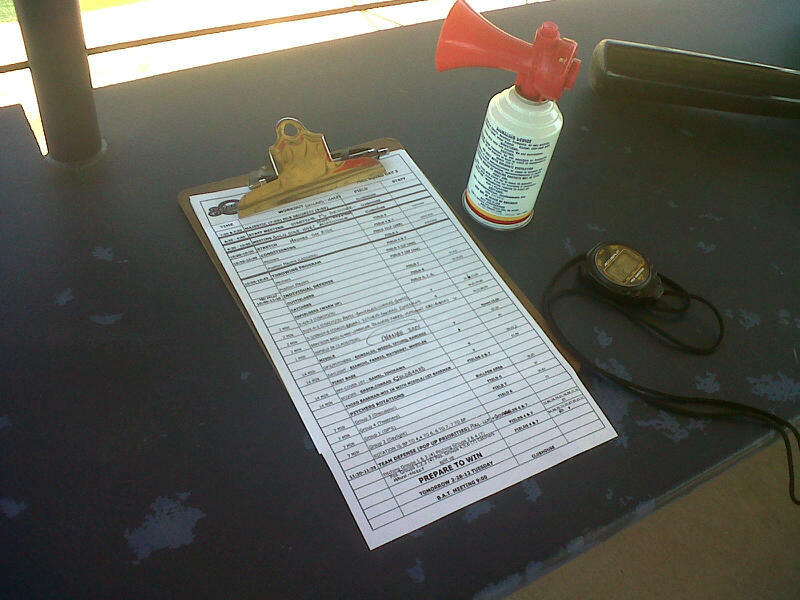 His tools of the trade include his detailed schedule on a clipboard, a stopwatch and, of course, an air horn (which his multiple unofficial comical applications). I love the large bold lettered phrase on the bottom of the sheet, “Prepare To Win!” It is there everyday for every coach and player to see and it’s beautiful thing. So, congratulations to Ed Sedar for a camp well coordinated. He is the Brewers version of an air traffic controller…with less dire consequences. Now, it’s on to Phase II, the exhibition games versus actual opponents. That presents a new set of challenges. At least for us, it starts to take the shape of a an actual baseball game.